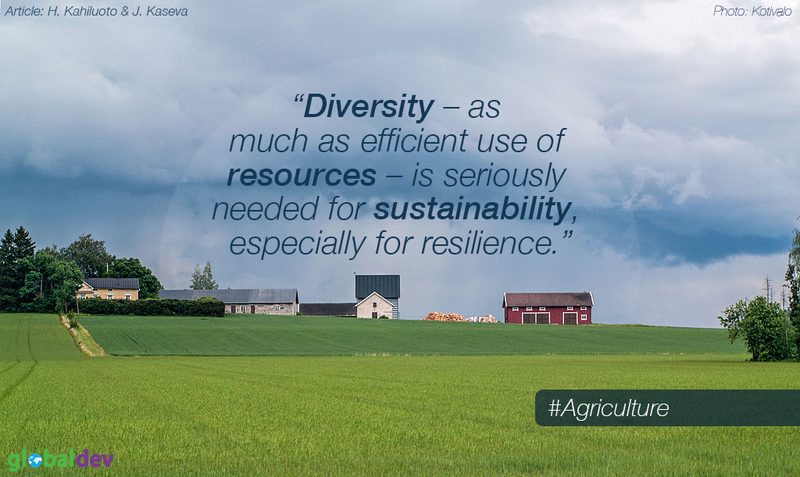 Efficient use of resources is important for farmers – but so too is diversity of farms to ensure sustainability and resilience. This column reports research on farms in Finland showing that there is no trade-off between diversity and efficiency. Indeed, careless specialization around the world has reduced efficient use of resources across the entire food system, making food supply unnecessarily fragile in our era of ecological and social instability. The paradigm of streamlined efficiency has contributed to the general belief that diversity implies inefficiency. Like many other paradigms, it has never really been tested. That is unfortunate, because diversity – as much as efficient use of resources – is seriously needed for sustainability, especially for resilience. In recent research, we test the streamlining paradigm using data for 3,268 southern Finnish farms with more than 30 hectares of agricultural land for 11 years and find no justification for believing that diversity means inefficiency. Farms with greater diversity of land use – more diverse crops – are no less efficient in their resource use than farms with less diverse crops. Our results indicate that there is either no trade-off or a negligible trade-off of no economic importance between farm efficiency and diverse land use (Kahiluoto & Kaseva, 2016). The relationship between diversity and efficiency is either positive or negative depending on the year, but always small and not statistically significant. We study total revenue in relation to use of capital, land and labor and to diversity of land use on the farms, taking account of the production line. The estimate we use for diversity – the Shannon-Weaver diversity index – describes how many different types of land use (crops, for example) a farm has and how evenly the agricultural land is distributed among those types. Rather than a regression analysis, we use a stochastic frontier analysis, which enables us to test the assumption of equally resource-use-efficient farms. We analyse information for each farm from the Finnish Profitability Bookkeeping data, the official database collected for the European Farm Accountancy Data Network, which is maintained by the European Commission. System management capacity represents a key competence of successful farmers. Developing and using that competence makes it possible to find a way to combine efficient use of land, labor and capital with sufficient diversity in land use to ensure resilience, in addition to economic efficiency. For example, given the recent price volatility of many agricultural products on global markets, it is useful to cultivate not only, say, oil crops, the price of which varies the most, but also to include grains or animal production in the farming system. It is also useful to include several crops with different variations in demand and supply on global markets. System management implies not only making choices to ensure diversity in response to critical changes and variability, but also ensuring that economic efficiency, such as efficient use of resources, is not reduced. Diversification should, for example, increase the evenness of labor use through the year rather than increase labor peaks and, while reducing inter-annual variation in revenue and probability of losses, not reduce average revenue. Indeed, diversity is the building block for resilience. Resilience refers to the capacity of a system – a farm, for example – to sustain, and if necessary to transform, its key functions and identity. Diversity provides resistance, but also options from which to choose for adaptability and transformability. One important aspect of combining resilience and efficiency is what kind of diversity is built into the system. Diversity can be more or less efficient. Diversity in response to critical change and variability is the key to providing crucial services such as food security in times of uncertainty. For example, it is extraordinarily important to ensure sufficient diversity of crops to cope with climate change and extremes within one farm or region, and within the entire set of available cultivars of staple crops (Kahiluoto et al, 2014). A reluctance to question the streamlining paradigm of ‘one size fits all’ solutions has led to long-lasting and far-reaching homogenizing and specializing at all levels of food systems, and made food supply unnecessarily fragile in our era of global ecological and social instability. This careless specialization has also reduced efficient use of resources at the level of the entire food system. Just consider regional specialization of farming in terms of spatial separation of cropping and cattle, which leads to loss of valuable nutrients (Kuisma and Kahiluoto, 2017), water systems, and money. It is time to change gears. Helena Kahiluoto is professor, Dr., Sustainability Science, Lappeenranta University of Technology, Finland and Adjunct Professor, Agroecology, University of Helsinki, Finland.